As mentioned at the end of January, I’m focusing on female authors for the entire month of February, as my book group Dragons & Jetpacks has declared it ‘Women Writers Month’. I thought I’d start off by discussing my favourite female authors, and I’d love to hear yours! My current lady of the moment is Diana Gabaldon, author of the fantastic Outlander series. If you’re into historical fiction, give it a try (or give the show a watch, totally worth it just for Sam Heughan alone, not to mention the beautiful Catriona Balfe and the gorgeous Scottish landscapes). Diana: thank you SO MUCH for creating the beautiful Scotsman that is Jamie Fraser. Do I really need to explain this one? J.K. Rowling is my queen and shaped my childhood, forever. Sarah J. Maas is another female author I love, although I’ve only read one of her series – Throne of Glass. I met her in 2013 and she was the sweetest. She brought her own copy of Throne of Glass for fans to sign, and it travelled all over the world. It was pretty cool being able to sign something that my fellow bloggers had also signed! I’m going to make a mention of Jaine Fenn, who is truly lovely. She writes science fiction, and I first came into contact with her in 2013. She took part in my Sci-Fi Month event with an author interview, and I’ve met her twice now, both times at Bristolcon (where I was very shy because I actually don’t know how to act around authors…). She recognised my name instantly, thanked me for my review of her recent short story she’d sent me, and mentioned she had a new release coming and would I like to review it. Basically, she knows how to interact with her fanbase very well. Her sci-fi series is a mix of books to be read in order, and others that can be read as standalones within the same universe. Marianne Curley and Katherine Roberts cannot be forgotten! Both of these ladies write fantasy for younger audiences, and wrote some of my favourite books as a child/teen. And both of them took time out of their busy schedules to let me interview them for my blog. Like Jaine, they are lovely people and know how to treat their fans 🙂 Marianne has written the Guardians of Time series which involves time travel (yaaaas) and Katherine has written several series, my favourite being the Echorium Sequence, where words and song are power. Kristin Cashore, S.J. Kincaid, Suzanne Collins, Laini Taylor, V.E. Schwab and Rhonda Mason. Which fabulous ladies of fiction are your favourites? Fantasy Friday is my own feature, posted every other Friday. It’s pretty self-explanatory: I do a feature on something to do with the genre. Sometimes it will be a book recommendation, sometimes showcasing a book or series I’ve loved and other times it might be a discussion post. You’re more than welcome to join in with this feature, let me know if you make your own Fantasy Friday post! Today I want to talk about: gateway fantasy books. I know that fantasy can sometimes receive a bit of a bad reputation – some people seem to think it’s either a really difficult genre to read, or really geeky, or they just have no idea where to start. So I want to share with you today a three stage process for people new to the fantasy genre. I’ve split them into three ‘stages’, with the idea that you tackle them in order, to build up confidence reading the genre. It was really hard to split these books into stages, and I hope my explanations of why and how I split them make sense and don’t offend anyone! These books come under ‘Stage One’, as they are either aimed at younger readers so the fantasy world is not as complicated as say, The Lord of the Rings, or they are set either partly or entirely in our world. I think these are pretty good books to start with, particularly the ones set in our world: Sabriel by Garth Nix, Inkheart by Cornelia Funke and The Magicians by Lev Grossman (this one is definitely an adult book!). This way you won’t be immediately thrown in at the deep end, and at least some elements of the story will be familiar. The Amazing Maurice and His Educated Rodents by Terry Pratchett and Song Quest by Katherine Roberts are set in fantasy worlds, but are aimed at younger readers so you know you won’t need to worry about keeping up with a huge cast of characters, assortment of strange languages and entirely new and vast geography that you might find in books for older readers. I say ‘less detailed’ because I do not mean in ANY way that the author has only half-heartedly created their world, or that these books are seen as ‘lesser’ fantasy. I just mean that the scale of the world-building is as not big as some of the books in the next stage. ‘Stage Two’ includes these sorts of books, as well as Young Adult Fantasy, which often falls into the category anyway. Throne of Glass (my review) by Sarah J. Maas, Graceling (my review) by Kristin Cashore, The Wind Singer by William Nicholson, Finnikin of the Rock (my review) by Melina Marchetta and Shadow and Bone by Leigh Bardugo come under Young Adult fantasy fiction, and all are fantastic examples of the genre. Mort by Terry Pratchett, like the rest of the Discworld books, is primarily aimed at adults but Pratchett’s brilliant sense of humour makes it a lighter read. Feeling ready for ‘Stage Three’? By ‘heavier’, I mean that these books have more detailed world building than those in Stage Two – perhaps the author has created an entire history, a new language etc. If you’re prepared to take a dip into the world of heavier fantasy, then I’d recommended starting with The Magicians’ Guild by Trudi Canavan. And if you’re not too scared of reading some Tolkien, then give The Hobbit (or even The Lord of the Rings) a shot! So many people are unsure about reading his work, but I was recently interviewed by Pages Unbound for Tolkien Reading Week, where I shared my love for Middle-earth – hopefully that will convince some people! As you feel more confident with reading fantasy books, I would highly recommend the following: The Painted Man by Peter V. Brett, The Final Empire by Brandon Sanderson and The Name of the Wind by Patrick Rothfuss. Are you going to give any of these books a try? Have you read any of them already, or are there any others you’d recommend for new fantasy readers? Today, as part of Sci-Fi Month, I have a guest post written by the wonderful Katherine Roberts, author of The Echorium Sequence, The Seven Fabulous Wonders series, and most recently The Pendragon Legacy. Don’t forget to check out the schedule for the rest of today’s posts. You can also Tweet about the event using the hashtag #RRSciFiMonth. Dragon Riding – Science or Fantasy? 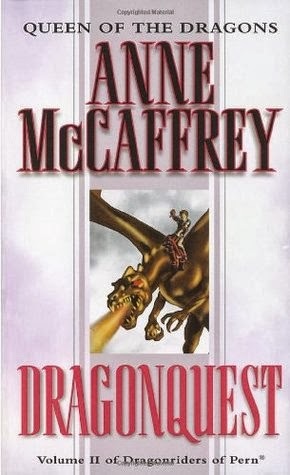 It was Anne McCaffrey who first introduced me to dragon riding. As a teenager, I devoured her Pern books, set on an alien planet colonised by humans who have bred dragons to help them fight off an alien spore called Thread, which falls from the Red Star. Although strictly science fiction, these books have a fantasy feel because the colonists have forgotten most of their early history, and no longer have space flight. Anne McCaffrey’s dragons are amazing, beautiful creatures of different colours, from aristocratic golds, through bronzes and blues, to the lowly greens. They can fly ‘between’ space and time, and form an emotional bond with their riders upon hatching known as ‘impression’ – a bond so strong that the death of one partner often means the suicide of the other. 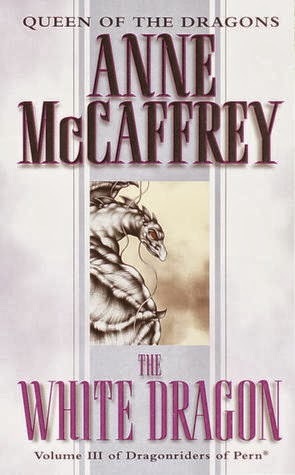 My favourite books from the Pern series are “Dragonsinger” about a girl from a sea-hold who becomes a friend of dragons and a Harper, and “The White Dragon” about the son of a Lord Holder, who accidentally impresses the white runt of the hatching ground. In this case, the dragons are villains rather than heroes, at one with their dark riders in their pursuit of the prey. Friendly dragons are popular in books and films for children, including Cornelia Funke’s Dragon Rider and the TV series Merlin, where a dragon advises the young wizard. More recently, I came across dragons in Julia Golding’s Young Knights series, where they are the unwilling slaves of the Fey, kept chained in the dark until they have lost their bright colours. 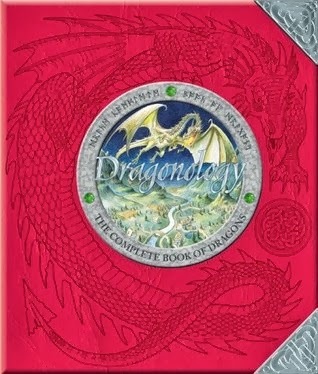 On the non-fiction side, my publisher Templar produced Dragonology with its beautiful jewelled covers for students of dragon lore. And Peter Dickinson wrote a wonderful book Flight of Dragons, which takes a scientific approach to dragons, examining how it’s possible for them to breathe fire and fly. Dragons were always going to feature in my Pendragon Legacy series, since Pendragon means ‘head dragon’. But I take a different approach to dragon riding, as my books are set in the Dark Ages after the Romans left Britain when dragons are thought to be extinct – killed off by heroic knights from the old stories rescuing damsels in distress. King Arthur’s shield bears a red dragon design, scarred by battle. In the first book Sword of Light Merlin takes this shield from the dying king’s body and gives it to Arthur’s daughter, Rhianna, because he thinks she’s going to need it to defend herself against her evil cousin Mordred. The shield comes in useful when the first live dragon appears in the shape of an ice-breathing shadrake from the dark land of Annwn, which chases Rhianna and her friends when they leave the safety of Avalon. The third book of my series takes Rhianna and her friends to Dragonland in search of Arthur’s crown, which was stolen by a dragon from the battlefield when the king fell and carried off to its lair. The Pendragon crown turns out to contain the ancient secret of dragon riding, hidden in one of the jewels as you might store data on a computer disk. When Rhianna wears the crown she can access its secrets, and her spirit escapes her body to fly with the nearest dragon. This is a useful skill, since it means she can see through the dragon’s eyes – but it also leaves her body chained in the dark at Mordred’s mercy. My own theory of dragons is that they were dinosaurs, which somehow survived whatever disaster wiped out their species on Earth, and (being long-lived reptiles) lingered on into the middle ages to terrorise people. I can easily imagine hot-blooded young knights, in search of adventure or reward, riding out on dragon hunts to kill them. The poor creatures would probably have holed up in the high wild places, maybe breeding occasionally, but struggling to survive in Earth’s new climate and eventually dying out as humans took over. Did anybody actually ride them? I can’t say for sure, but there are just too many stories and legends to dismiss dragons as pure fantasy! Where do you think dragons came from? Katherine Roberts won the Branford Boase Award in 2000 and writes fantasy and historical fantasy for young readers. The final book in her Pendragon Legacy series Grail of Stars is published this month by Templar in hardcover, and the first three titles are now available in hardcover, paperback or ebook. More details at www.katherineroberts.co.uk or Twitter @AuthorKatherine. I also interviewed Katherine back in August. Fantasy Friday is my new feature, made to replace Why You Should Read This Book. It will be posted every other Friday. It’s pretty self-explanatory: I do a feature on something to do with the genre. Sometimes it will be a book recommendation, sometimes showcasing a book or series I’ve loved and other times it might be a discussion post. You’re more than welcome to join in with this feature, let me know if you make your own Fantasy Friday post! Today I want to talk about: common themes in fantasy fiction. In many fantasy worlds, there is a monarchical system, or the story often involves bringing back the rightful heir to the throne (The Lord of the Rings: The Return of the King). Or, as in the series A Song of Ice and Fire, there are many rival houses fighting for the throne, each with their own aims and ways of life. Or in books such as Prince of Thorns, the story is told from the point of view of a member of the royal family – but Jorg is perhaps not your typical monarch! Like King Joffrey Baratheon, many royals are not best suited to ruling the people – it often seems to me that in fantasy fiction, rulers go either way. They are either evil and hated, or wonderful and kind. And you know, sometimes they just deserve to be slapped. Often, our once normal seeming main character finds out that they are destined to do something. Just look at Harry Potter. It feels like a bit of an overused concept – the idea that this one person is the only one who can bring peace to the world – but it works. Peter V. Brett has a interesting spin on this with his Demon Cycle series, where the Deliverer could either be Arlen or Jardir. This sort of plotline often involves a prophecy of some kind, predicting the events that the hero(ine) has to undertake. And with the Chosen One comes the Dark Lord! The evil foe that our Chosen One has to overcome, and many series actually just use the title ‘Dark Lord’ (Lord of the Rings, Harry Potter). In many books the Dark Lord seems to do little himself, and frequently uses minions or messengers (Nazgul, Dementors, Death Eaters) to do his bidding. Many times in fantasy novels, our heroes have to save the world – and they’re the only ones who can do it. Whether it’s destroying a magical object or an enemy force, it’s normally a long and arduous process with many trying events. Although fantasy novels tend to cover many different races, elves and dwarves seem to be the most common. And, as in Tolkien’s work, rivalry between the two is common. Of course, the two mythological races have been part of folk tales for many centuries – but it was Tolkien that gave elves their taller form that is frequently seen in fantasy today. In The Lord of the Rings elves are a proud and majestic race, in stark comparison to their down-trodden counterparts in the Dragon Age series, where elves are enslaved. With our Chosen One and his epic quest, comes the trusty companions. But sometimes they’re not so trustworthy. Whilst it is not always the fault of the character – for example, Boromir turning against Frodo at the end of The Lord of the Rings: The Fellowship of the Ring/beginning of The Two Towers because of the influence of the Ring – there are many sudden betrayals and shocking twists when it comes to friendships. Brave knights in shining armour, swooping down to save the damsel in distress… yeah, not always a feature in fantasy. Often you’ll find that the knights aren’t quite as brave or honourable as they should be. A Song of Ice and Fire is full of Sers, and many of them are not at all deserving of such a title – but it’s the kind of place where you don’t rise up the food chain by being nice. Plus there are many fantasy novels based around Arthurian legend, which of course feature knights, and play upon the familiar figures in their own way. I always find something fascinating with this particular type of person. In video games I tend to play the sneaky assassin type classes (my newest Skyrim character is a heartless assassin and a thief). There has to be someone for the knights to protect the common people from! But then there are stories like Graceling where the main character does not want to do these things, but has no other choice. And of course – magic! A very, very common theme in fantasy, it works in so many different ways. In Harry Potter, it’s a case of waving your wand and saying the right words. In The Name of the Wind, magic, or ‘sympathy’, requires some sort of sacrifice. Magic in The Demon Cycle series is dark and involves demon remains – whereas the Abhorsen trilogy covers necromancy. And sometimes magic just doesn’t feel like the right word for the kinds of skills characters have; it feels too juvenile. If you want to join in with this week’s Fantasy Friday, feel free to leave your link in the comments! I first read this series when I was about ten or eleven, not too long after it had first been released in the UK, and absolutely fell in love with it. I was lucky enough to interview Marianne Curley a couple of months ago, and The Named was also my first ‘Five Reasons Why You Should Read This Book’ feature. As it’s set in Australia, there would be some beautiful scenery – not to mention all the time travel scenes. I even have an idea for cast members – I could see Douglas Booth as Arkarian because of his chiseled features, and Robert Sheehan as Ethan. One word: epic. This space opera series is just absolutely fantastic and would make SUCH a brilliant series of films. With a great variety of characters, there are plenty of actors and actresses who would fit in so well. Plus seeing the Shrike on the big screen would be amazing. There’s just the right mix of action and character development to make this a silver screen hit, in my opinion. Apparently Warner Bros. have had the rights to make a film for several years, and Matt Damon has expressed interest in working on the script, but they have yet to make any progress on it. It would certainly be an expensive project so I guess that’s the main issue at the moment. I also featured Hyperion as my second ‘Five Reasons Why You Should Read This Book’. Oh, this would be a tough one. With the fanbase it has, the film version would need to be perfect and match Rothfuss’ writing precisely. It could be an absolutely stunning film, a sort of Harry Potter for the older generation (popularity, not strictly content wise). My book group actually discussed a fantasy casting for a film of this, and came up with some pretty interesting ideas. I haven’t yet read The Wise Man’s Fear, but several friends have said they did not enjoy it as much as the first book – I’ll have to wait and see. This series. Read it now. Another one that I’ve featured in ‘Five Reasons Why You Should Read This Book’ – it would make a brilliant fantasy epic. Although I wasn’t as impressed with The Daylight War as I have been with the other two (I plan on putting a review up soon), I still love Brett’s writing. He’s pretty awesome and interacts with his fans a lot, including hosting fanart contests. I’d love to see how the different types of demons appear on the big screen, and the fight scenes would just be fantastic. This would make such a fun movie, although it could be potentially problematic what with all the pop culture references. I also wonder how the OASIS would appear. Would they just film it normally so it looks real? Or would there be a subtle hint of illusion hidden beneath everything? I could also imagine the stark differences between reality and the game, and how well that would work on film. As with the Guardians of Time trilogy, this is another series I fell in love with when I was younger, and another of my favourite childhood authors that I recently interviewed! It would make a lovely film series for the middle grade audience, and would definitely be something different to the usual fantasy series. The only problem with making a film like this would be finding the right cast – for example, in my opinion the first few Harry Potter films suffered because of the acting skills of the cast when they were younger. I’m so amazed that this hasn’t been adapted yet. It’s been out for over fifteen years, has a massive fanbase and it just so, so brilliant. Perhaps when it was published the techniques hadn’t yet been developed to allow the film to be created to its full potential, but now they definitely have. The last news of a film based on the series was in 2008 – someone in the film industry is missing out on something big! Yeah so I haven’t even read the second or third books. I’m STILL waiting for Fire to arrive at my local library (it’s been in transit for nearly three weeks?! ), but I know that Graceling would make a fantastic film. I discussed in my review of Graceling that I somehow pictured Po as Fenris from Dragon Age II… so if he doesn’t look like that in the film I will be very confused, even though his description is completely different. Oh, and this one actually is heading to the big screen, it’s just not clear when. My first non-fantasy or science fiction suggestion! I really loved this book and think it would make a beautiful film, as it’s set in Cambridge, as well as an excellent thriller. The casting for this one would have to be very well done though, as the portrayal of each character is very important. And my last choice… some historical/mythology-based fiction. I love Greek mythology, particularly the stories surrounding Troy, so I would definitely watch a film of this. I also think that it would be wonderful to see Miller’s take of the story on screen as it covers a homosexual relationship, a part of the story that many screen versions of Achilles leave out. Of course, it’s not completely certain what the relationship between Achilles and Patroclus really was (if the two ever actually existed), but it’s nice to see it addressed this way for once. Plus the story is beautifully written and highly emotional. I’m so happy to say that I have a very special treat for you today, my dear readers: an interview with Katherine Roberts! When I was younger, I was absolutely in love with a series called The Echorium Sequence. I still have the books, and have lost count of how many times I re-read them over the years. So you can imagine how excited I was when I emailed Katherine for an interview, and she agreed. The fourth book in her Pendragon Legacy, Grail of Stars, is due out in October 2013. Rinn: Hello Katherine! Firstly, let me say thank you so much for letting me interview you. One of your earlier series, The Echorium Sequence, really fascinated me as a child; it’s really exciting to have this chance. Katherine: Glad you enjoyed the Echorium Sequence! The first book Song Quest was my debut novel and also won the Branford Boase Award, so that trilogy will always be special to me. Song Quest was also re-released in 2012, with a beautiful new cover. Rinn: Can you tell us a little bit about your current series, the Pendragon Legacy? 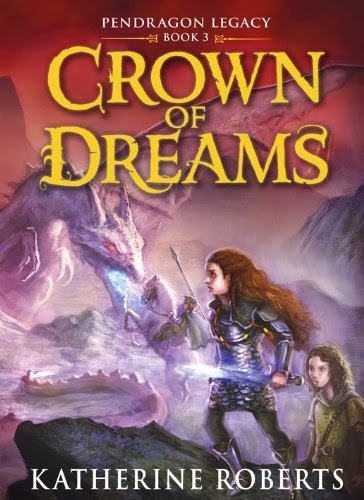 Katherine: It’s a traditional four-book fantasy series for younger readers about King Arthur’s daughter, Rhianna Pendragon, who arrives on the scene after Mordred kills Arthur at the end of the legends. Rhianna has grown up on the magical isle of Avalon, and has no idea she is heir to the throne of Camelot until Merlin brings Arthur’s body through the enchanted mists from the battlefield. Shocked to hear that her cousin Mordred killed her father and is plotting to seize the throne, she sets out at once to find the four magical Lights – the Sword of Light (Excalibur), the Lance of Truth, the Crown of Dreams, and the Grail of Stars – which have the power to restore Arthur’s soul to his body. Soon after they leave Avalon, Merlin is ambushed by Morgan Le Fay, and his druid-spirit ends up trapped in the body of a falcon (a real merlin). Fortunately, Rhianna has the magical support of her Avalonian friend Prince Elphin, and when they reach Camelot they are joined by her maid Arianrhod and a brave young squire called Cai. Together, the four friends battle dragons and Mordred’s bloodbeards to save Camelot. Rinn: Which of the characters in the series is your favourite, and why? Katherine: They’re all so different, it’s hard to choose. Rhianna is a warrior princess, but she is not allowed to blood her Excalibur if she wants to take the Sword to Avalon. Elphin is gentle and kind, and works magic to help his friends even when it hurts him. Arianrhod has been mistreated by her old mistress Morgan Le Fay so is rather timid, but comes into her own on Rhianna’s final quest for the Grail. Cai is a bit hopeless at first – the sort of squire who is always spilling things and falling off his pony – but he learns fast, and ends up fighting dragons. So they’re all heroes (and heroines)! If I have to pick just one, then I think Elphin has to be my favourite, because who can resist a violet-eyed fairy prince? Rinn: The Pendragon Legacy, is based around Arthurian legend. Why did you decide to write a series using mythology, and why Arthurian legend in particular? Katherine: I’ve always been fascinated by the Arthurian legends, especially the powerful women. I very much enjoyed Mists of Avalon by Marion Zimmer Bradley, an adult fantasy novel that retells the Arthurian legend from the point of view of the women, and wanted to do something similar for young readers. That’s why I created a daughter for Arthur, rather than the more obvious son. Rinn: Did you do a lot of research for the series, or was it something you already had a lot of previous knowledge about? Katherine: I knew most of the popular Arthurian stories already, from my previous reading. I did do some historical research to get the background right, though not much of this found its way into the books. Since they’re for younger readers, I wanted to give them a fantasy feel and keep the story moving, without getting bogged down by too many historical details. Most of what we know about King Arthur is legend rather than history, anyway. If he did exist, he was probably a sixth century war-lord and not a king. He might have had a real daughter, but if so we don’t know anything about her. That’s what makes writing about Rhianna such fun, because I can make it all up! Rinn: You say you grew up in the South-west (me too! ), an area that has much to do with the myth of King Arthur. Did any local landscapes influence your writing? Katherine: Yes, I used to play in the caves under Tintagel as a child, where Arthur was supposedly born. I’ve also climbed Glastonbury Tor (which some people think is the ancient Avalon), and visited most of the places where Camelot might have stood, trying to imagine a great castle there. I also lived on the Welsh border for a while – explaining Rhianna’s quest to “Dragonland” in the third book. Some lovely artwork of characters from the Pendragon Legacy. Rinn: Your Seven Fabulous Wonders series also incorporates ancient myths. Is this something that has always interested you? Katherine: A lot of fantasy is based on myths and legends, so I suppose they must fascinate me. But I prefer to invent my own plots and create my own characters using the myths and legends as background, rather than retell the old stories as some authors do. The Seven Fabulous Wonders books are a mixture of history, myth and magic, but they are much more history-based than my Pendragon series, which might be why they appeal to boys. Rinn: All your books so far are predominantly within the middle grade/young adult range. Do you think you would ever write something for older audiences? Katherine: Well, I started out writing short stories for adults, and also wrote fiction for women’s magazines under another name. But my first novel (Song Quest) was published on a children’s list, so after it won the Branford Boase it made sense to go down that route for a while. I think the effect of the award has worn off now, however, so there’s a high probability I will publish adult fiction in future, as well as more children’s books for as long as publishers continue to want them. Of my published books so far, I Am the Great Horse is probably the most mature, being enjoyed by all generations – I couldn’t persuade Chicken House publish an “adult” edition of that one, but the ebook is available to everyone! Rinn: I note that one of your favourite books is Tolkien’s The Lord of the Rings (same as mine! ), what other novels have really drawn you in? 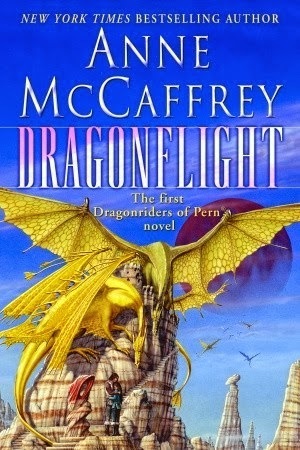 Katherine: Too many to count… I enjoy fantasy and science fiction that transports me to another world, and used to be a great fan of Anne McCaffrey’s Dragonrider books as a teenager. But it doesn’t have to be fantasy – any book where I can get totally wrapped up in the characters and the storyline works for me. The last book I read that really drew me in was The Hunger Games by Suzanne Collins. Rinn: On your website, you say that you did a degree in Mathematics. How did you end up becoming a writer? Katherine: I think I’ve always been a writer – not professionally at first, but I’ve always enjoyed creating stories, starting with telling my little brother bedtime stories when he was four (I was eight). I did a Maths degree because my teachers said it would be more useful than English… and they were right in a way, since I now need it to understand my royalty statements and do my accounts! Rinn: All writers have times when they struggle – what do you do to get around writer’s block? Katherine: Before I was published, I never had writer’s block. These days, I get blocked whenever I start thinking “will this book ever sell enough copies to pay the mortgage?” or “why is everyone else getting six-figure deals / hitting the best seller lists / getting their books promoted in the shops?” I don’t know how you get around that, apart from burying your head in the sand and staying away from the internet completely, which is more or less impossible these days. But I find most blocks occur at the business end of writing, not in the actual stories themselves. Rinn: Do you use the online community for feedback for your books, and if so, do you let it influence your work? Katherine: It’s impossible to avoid seeing reviews, so I’d be lying if I said these don’t affect my work. But I’ve learned only to take notice when several people (who should be the book’s ideal readers) are saying the same things. Negative reviews are bound to happen sometimes, usually when someone gets hold of the book who wouldn’t normally read that genre. Generally it’s good to get feedback, though, even if it’s negative – better than silence! Rinn: What do you do when you are not writing? Katherine: This might sound sad, but I’m pretty much always writing – or at least doing some kind of writing-related activity such as a blog post, interviews like this one, keeping accounts, research, reading other people’s books, publishing my backlist as ebooks, creating book trailers, keeping up with social media, etc. There’s so much more to do now than there used to be, it’s difficult to find time to actually write the books! Other than that, I try to exercise every day – I cycle, and I enjoy skiing in the winter. I used to have a part-time job riding racehorses, though I’ve not done that for a while. I do all the usual DIY, gardening, cooking stuff… but mostly, I write. It’s my career, so it’s important to me. Rinn: What are you currently reading? Katherine: I have three books on the go at the moment – Celia Rees’ The Fool’s Girl, Julia Golding’s Young Knights of the Round Table (which I couldn’t resist starting, since I’m doing an Arthurian event with Julia at the Bath Children’s Literature Festival in September), and on my Kindle I’m reading Alison Morton’s Inceptio – a brilliant alternative history debut set in 21st Century Rome. Rinn: And finally, one more question… who would attend your fantasy dinner party? Katherine: Prince Elphin, of course, to play his magic harp – so probably Rhianna would gatecrash, too. I’d have her father King Arthur, Merlin, Luke Skywalker (I’d give his dad a miss), the beautiful Fallen Star from Neil Gaiman’s Stardust, Gandalf the Grey (who would have to sit next to Merlin), Galadriel from the Lord of the Rings, Killashandra Ree from Anne McCaffrey’s Crystal Singer, and you of course… just let me know who you would like to sit next to!